While in La Rochelle last week, I had a chance to wander around the fair at the conference and ended up having a chat with the people at the EcoCompteur stand. Compteur is the French for 'counter'. It's a company that produces counters for pedestrians and cyclists, as well as other vehicles. It was interesting to hear how their technology works. It was all so exotic hearing phrase like pyroelectric lens, ZELT inductive loops, acoustic slabs and selective pneumatic. 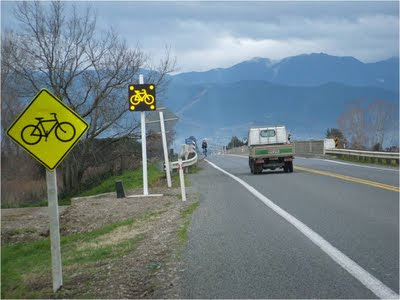 On a rural road in New Zealand there used to be only the sign in the foreground to warn motorists of a bicycle on the bridge. A static, overlooked sign. In the background there is a modern warning sign that flashes. 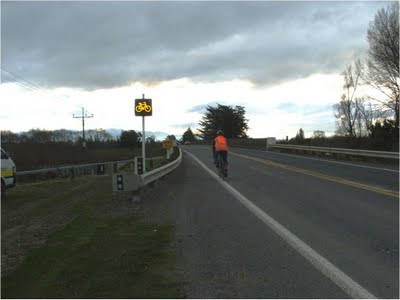 Now, when a cyclist triggers the sensor, the sign starts flashing for a certain period of time to warn motorists. Enough to let the cyclist get to the other end of the bridge. Increased safety. I suppose any size of sign is possible. Me... I'd prefer a massive sign that flashes "DO NOT KILL THE CYCLIST ON THE BRIDGE! HE/SHE HAS A FAMILY! ", based on the Sacred Bull in Society's China Shop School of Traffic Safety. 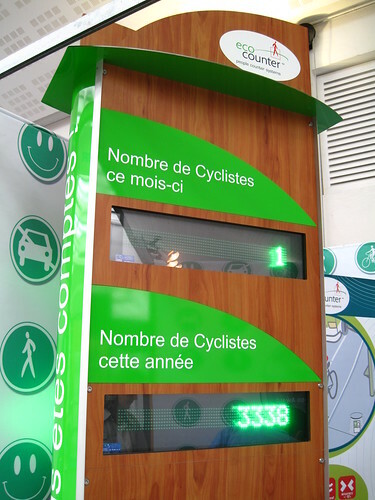 The company has also produced a similar sign and sensor in a tunnel near Valence, France, warning motorists of the prescence of one or more cyclists in the tunnel. There are different solutions to counting. Heat sensors and sensors under the asphalt. Perfect for data-collection. They have a little film about their products here.